The Reebok CrossWalk RT 5.0 treadmill has a number of attractive features including a power incline, 300-lb user weight limit, speakers, heart rate monitoring, and more. The Reebok CrossWalk RT 5.0 treadmill has a backlit display with a RaceTrack™ window to follow your progress around a track. Other readouts include speed, time, distance, pulse, and calories burned. The console is also compatible with the wireless iFit Live® app to track your workouts, nutrition, and fitness goals. 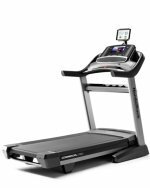 The Reebok CrossWalk RT 5.0 treadmill has DMX Zone cushioning which adds comfort to every step at the push-off point and the landing area. It also features a 2.25 CHP motor, 15 workout apps that include time, distance or calorie-burn goals, quick incline and speed buttons for adjusting your workout on the fly, a folding up design, and plug-in port for an MP3 player to either use with headphones or listen to music through the speakers. Users report that the workout arms are just “there”; they don’t really provide real resistance to work the upper body. You would be better off holding a couple of 5-lb hand weights rather than try to push and pull on these sticks as you walk. Another issue with the Reebok CrossWalk RT 5.0 is the quality control in construction as some treadmill reviews have complained that the ¼" bolts do not fit the too-small pre-drilled holes in the frame. The workouts powered by Google Maps™, and the training with Jillian Michaels and other iFit Live programs are nice, but it isn’t something you really need in a budget treadmill. At this low price, you want the better components in the motor and belt, rather than gimmicky entertainment features since a new replacement motor for the Reebok CrossWalk RT 5.0 will cost $200 minimum. Also, the iFit Live® is a separate $129 purchase for the module as well as an annual subscription to the website. Again, you would be better off spending any additional money on a better treadmill. ICON Fitness builds Reebok, Weslo, Epic, Proform, and Nordictrack treadmills, so many of them share the same features and frames. In fact, they are all assembled at the same plant in Logan, Utah. The Proforms and NordicTracks offer better features than the Reebok and Weslo treadmills, which carry something of a poorer cousin stigma among ICON brands. 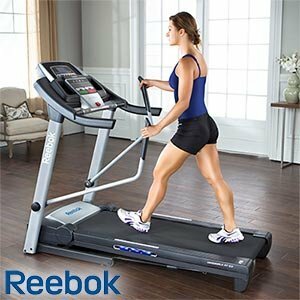 While you can find the Reebok CrossWalk RT 5.0 treadmill $785 on Amazon, and around $550 at Costco stores, we still don’t recommend it because of the poor quality of parts and construction. Check out the better built, better designed Horizon T101 treadmill instead.